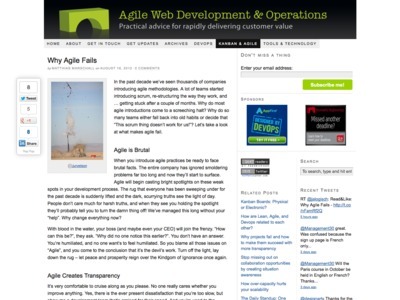 “Agile will begin casting bright spotlights on these weak spots in your development process. The rug that everyone has been sweeping under for the past decade is suddenly lifted and the dark, scurrying truths see the light of day. People don’t care much for harsh truths, and when they see you holding the spotlight they’ll probably tell you to turn the damn thing off!